He also liked synthesisers because he loved Brian Eno's, or Philip Glass' music, but also that of Nina Hagen and other artists from the non 'formal' scene. I believe it was enough to present him with a subject which he would like for him to catch on it. I also feel that it is this dilettantism, in the most original sense of the word, which made him so accessible for every audience, because Scott disassociated his instrument from music at large, hence I might also say that he played in the same manner that the 17th and 18th century musicians did in their own time. An era which, far from being restricted to lace and sweeps of the leg, was just as brutal and hard for the body, included among the well to do, than what exists in the Third World today, and a fortiori for musicians; if we shall take this into consideration, it might help us to get away from any insipid prettiness. He, for one, had done this - from Scott Ross - An Unfinished Destiny by Michel Proulx. The quirky prose of Michel Proulx's own English translation of his Scott Ross, Claveciniste - Un Destin Inachevé provides the answer to yesterday's question of which sadly departed classical musician was a fan of the 'mother of punk' Nina Hagen? Michel Proulx's priceless little biography featured in The perfect ethical and musical Christmas present. Scott Ross, who is seen in my header photo, appeared in If you only buy thirty-four CDs this year - buy these, and sadly in The rumours about Aids were spreading, while back in 2007 I followed in his footsteps in France. TWD, I've emailed Michel Proulx to see if the English edition is still available. I'll post an update when I hear back. 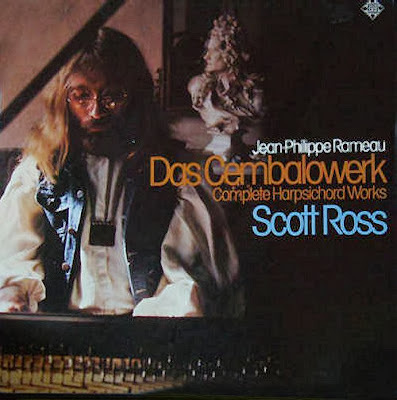 Well there's a coincidence; I'm listening to Ross's Scarlatti as I read this (I'm up to K.373). dfan, do you stick Post-it notes like I do on the next CD to play so you remember where you have got to in the thirty-four CDs? I do the same with my boxes of Haydn symphonies and quartets. Hello, the English edition may be made available, it's just that it needs reprinting and binding, which I generally do by the unit. It's a bit of a hassle, but I'm willing to do it. Postage for the USA turns around 5 or 6 euro. For the book itself 15. As I said in my 2005 post, buying that book is quite a trip. But it's a trip worth taking. Do you know any other publisher that hand prints and binds each copy - all for 15 euros = 20 US dollars? I too am listening to Ross's Scarlatti as I type, Kk 80. The recent posts sent me back to the beginning of the box! Am I the only one that was shocked that these recordings did not make it on to Gramophone's 250 "greatest" recordings of all time?